Our campaign calling for a dedicated Minister for Older People has achieved huge support. Celebrities with Grey Pride! 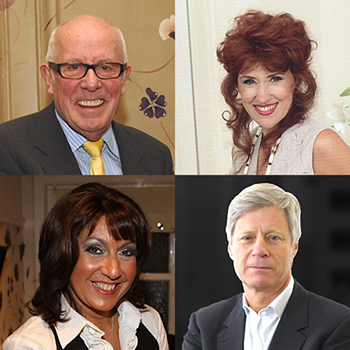 These famous faces have all signed our petition calling for a dedicated Minister for Older People, and spoken out to help raise awareness of Anchor's campaign. "We elderly are a crucial sector of society. Crucial because we vote. Crucial because we are growing in numbers. Crucial because we are a resource...Now is the time for us to have a real fighting champion, our own minister." "The collective experience and wisdom of Britain's older generation brings enormous value to our society, and it is high time that people of all ages appreciate the role over-60s can play in our workplaces, communities and families. I join Anchor in calling on our Government to create a dedicated Minister for Older People to give all people in their Golden Age a champion at the highest level." "I've been a campaigner for the infirm elderly over the past ten years, and have become only too aware of how easy it is for those in authority to marginalise old people and ignore their needs. Today the elderly population is growing as budgets grow tighter. We need a robust voice at ministerial level to ensure that they can spend their last years in dignity, not distress." "As a fully qualified member of the older generation on and off screen, I fully empathise with Anchor's Grey Pride campaign to appoint a Minister for Older People. It would be a big step in securing the support needed for older people to truly enjoy their twilight years. "Whether on or off screen, growing old is one of the few certainties in life, so it makes perfect sense that Government should install a dedicated Minister for Older People. Anchor’s Grey Pride campaign is justifiably raising this point at the highest level, furthermore, its success will hopefully ensure that the needs and concerns of older people of the current and future generations are adequately looked after." “I am happy to support the Grey Pride campaign as it stands to improve the lives of so many people in this country. Hopefully, the appointment of a Minister for Older People will relieve some of the anxieties associated with growing old by making sure older people are being looked after at the very heart of Government. After all, old age is a part of life and should be something people look forward to and celebrate, not fear." “The rapid ageing of our population is an unprecedented phenomenon and it is far from clear that policymakers have thought through the enormity of the implications. I strongly endorse Grey Pride’s appeal that, one way or another Whitehall, Westminster and the devolved administrations simply must make Britain’s ageing a major and consistent political priority." “Getting old is a part of life, so I fully support the call for a Minister for Older People; we need someone to look after the interests of us more mature folk. An ageing population, combined with cuts to pension pots and concerns over how to fund care for the elderly,means it's more important than ever that older people's needs are being addressed in Parliament by someone who can see the full picture. And remember, getting older is not an exclusive club, we are all members and it comes quicker than you think." “It’s time us grumpy old women and our grumpy old men had someone to look after us. We've spent our lives looking after our families now it's our turn." "It's great to get involved in a very important cause." Our campaign for a Minister for Older People received cross-party backing with MPs from all the major parties signing our Early Day Motion, petition and publically calling for a Minister for Older People. Our campaign calling for a dedicated Minister for Older People is supported by a wide range of organisations working for older people, read their quotes below. We are also supported by Independent Age, Your Care Rating and the Over 50's Parliament. "Dementia UK has joined the growing number of people and organisations calling for a dedicated Minister for Older People. A Minister will help to give older people a voice in Government in order to protect the services and promote issues that specifically affect them." “Anchor’s Grey Pride campaign is something that every citizen in 21st Century Britain should support and subscribe to. This century will be above all a century of older people. Older people have much to celebrate and a lot to contribute to society and they are at the very heart of localities and communities. I support Anchor’s desire to see older people move from the sidelines to where they belong – at the centre of policy and national life. I believe that the appointment of a Minister for Older People would give a focus to the contribution older people make to society”. Independent Age are pleased to be supporting the Grey Pride Campaign calling for a Minister for Older People. All of us have a responsibility as individuals to champion the rights of older people and to highlight the qualities they bring to our families, communities and organisations. It’s vital that government also plays its part by championing the contribution of older people, recognising their needs and coordinating the services and policies that affect them." "Care Management Matters is a great supporter of the Grey Pride campaign. There are over ten million people aged 65 or over in the UK and the appointment of a dedicated Minister for Older People would ensure that their needs are better understood and represented in parliament." "A Minister representing the needs of older people would be welcomed. We are therefore delighted to support the Grey Pride Campaign. With increasing longevity – which is to be welcomed – our aging population are facing a range of issues, including pressing concerns around long-term care, which need a strong voice in government." "Action on Elder Abuse is pleased to support the petition for a Minister for Older People, older people deserve dignity, respect and protection and we as a Charity who work with older people, see on a daily basis the abuses that happen to older people. It is essential that they have a voice and the government gives them the support they need. Please get involved, and make a difference." "The Chief Fire Officers Association is committed to working with partner agencies to improve the lives of the most disadvantaged older people and prevent deprivation in later life. Consequently, the Association is keen to support all those seeking to achieve these important objectives and as such we are happy to lend our support to Anchor's Grey Pride campaign." "Congratulations to Anchor for calling for a very much needed dedicated Minister for older people. It's time to bring about changes and raise the profile of older people." "Helping people to save and plan for their retirement is a central part of what we do. We have supported the progress the Coalition Government has made in encouraging pensions savings through initiatives such as auto-enrolment and the work undertaken by the Commission on Funding of Care and Support under the leadership of Andrew Dilnot. Most people are aware that they should save for their old age and that they will need to make contributions to the cost of their care in later life but they need a clear path, set out by the Government, that shows them how the costs will be divided fairly between themselves and the state. I believe that a Cabinet Minister for Older People could help to drive the resolution of these issues and that is why Legal & General is supporting Anchor's timely and much needed campaign." “Barchester Healthcare is pleased to support the Grey Pride campaign, calling for a senior Minister for Older People. As one of the leading quality care providers we are fully supportive of any initiative that acknowledges, and celebrates, the value older people contribute to society. A Minister for Older People is a step in the right direction." "This is a great initiative and we whole heartedly endorse the need to appoint a Minister for Older People. With a rapidly ageing population, it is essential that this vital group of people is given a voice within Government so that their needs and views are heard." "Stonewall Housing is delighted to support the Grey Pride campaign for a designated Minister for Older People. 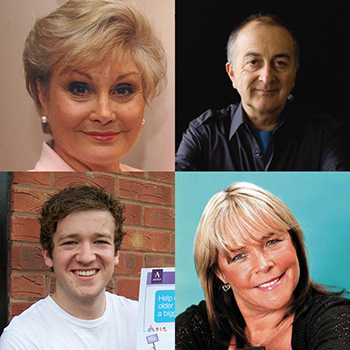 We look forward to a more inclusive future for older lesbian,gay,bisexual and trans people." "DropBy is proud to support Grey Pride and to encourage the Government to appoint a Minister for Older People. Older people are valuable members of our society and should be recognised as such. Our Mission Statement is "We all have the right to be valued to the end of our life and to live out our years in peace, with care, with love, and with dignity." As the number of older people in society grows we need to ensure that our voice is heard with increasing strength in Government circles and beyond." “Our ageing society is one of the biggest issues facing this country and a significant one for employers. We’re proud to support Anchor’s campaign for a Minister for Older People to sit in the Cabinet to ensure that a response to demographic change is a top priority for Government." "Curahq.com fully supports the call to appoint a dedicated Minister for Older People. Older people represent a significant, and growing, proportion of our society and it is important their views are represented with the focus and strategic direction only a dedicated representative can bring." "There is a blatant inequity whereby there is a government minister for children and a children’s commissioner, yet no equivalent for older people. We stand shoulder to shoulder with Anchor in their Grey Pride manifesto and call upon the government to appoint both a minister and commissioner for older people. As the largest and most authoritative survey of care home residents in the country, we know and understand the issues which are important to care home residents. And top of the list are having a say in the care they receive and being listened to. Having a dedicated minister and commissioner for older people would give them a voice at the heart of government." If your organisation would like to join us just get in touch with our Communications team.